n Tuesday evening I had the pleasure to see the entertaining Hamburg/Berlin theatre collective She She Pop perform Seven Sisters, their take on Chekov’s Three Sisters, at Gothenburg’s Pustervik Theater on Järntorget. The first time I saw She She Pop, a year ago, also at Pustervik, they were grappling with King Lear and brought in their fathers (three fathers anyway) to help out. In Seven Sisters they involve their kids (three kids aged 4, 3 and maybe 2-years-old). As with their take on Lear (which they called Testament), Seven Sisters is less a performance of the canonical play, more She She Pop coming to terms with the play, the characters of the three sisters, their brother and his wife, and the ideas that Chekov has his characters express. The actors’ interaction with Chekov’s text, their interpretations of key ideas and phrases, their application of Chekov’s satire to their own (possibly fictionalised) situations and personas, is all performed with a glint in the eye and a fine irony. Seven Sisters is clearly the product of a process of improvisation, and the immediacy of that process still hangs about the performance, though I wonder how much on-stage live impro they let themselves indulge in on Tuesday. A little, I think, towards the end, because that was just where the performance limped. 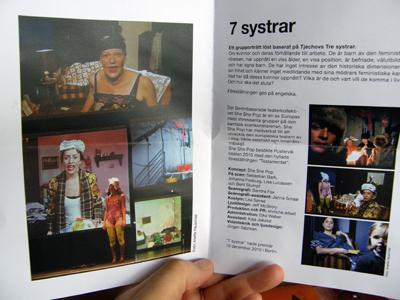 Though the Seven Sisters actors are all German speakers, the performance in Gothenburg was in English. Very good English too, but improvisation in a foreign language and in front of an audience for whom the language medium is also foreign must be to take a self-imposed handicap to quite an extreme. By allowing and encouraging audience intervention in the development of our work we aim to explore the freedoms and difficulties inherent in the negotiation between individual decision making stategies and the production of collective/inclusive performance. The King Lear/Testament play from last year was performed in German, with (as I remember it) an Opera-style above-the-stage super-titling screen with Swedish(?) text. It worked. It’s good to see theatre bridging language barriers in this way. Still, if you can understand German you’ll probably get most out of a performance of Seven Sisters in its original language. I enjoyed the performance on Tuesday and ran a part of this review on my Twitter stream in the hope of encouraging people following me in Gothenburg to go along to the second of She She Pop’s performances. And if you, dear reader, ever have the opportunity to see a She She Pop performance yourself, then take it! The illustration is a picture of the programme from Tuesday. The original photos are credited to Annette Hauschild. Sie sind die besten! She she pop are pure gold! Glad you liked the review and that you enjoyed Testament.